Trafficking is often an issue referenced in the past or the present. Statistics concentrate on how many people are currently being exploited and the activities that they are forced to do, often justified as repaying debts the victim 'owes' to the trafficker. Sometimes victims of trafficking manage to escape or are rescued. 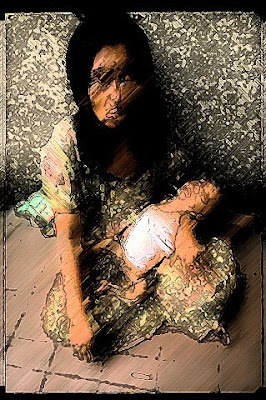 Facing the fear of what will happen to them and their families if they speak out against the trafficker, the victim’s story is always a harrowing account of the difficulties involved in putting one's life back together. Post traumatic stress disorder is common amongst women who have been trafficked and forced into prostitution. And if a person is freed, because they often return home to the same desperate economic conditions that led them to seek employment to begin with, there is always the chance that they will re-trafficked. Walking through the streets of Phnom Penh, each footstep has to be carefully placed to avoid pools of dirty water, sewage and an array of rubbish. Feeling hot and flustered I glanced down the street to mentally plan my path through the debri. I saw a lady sitting in the middle of the street near to where cars, trucks and tuk-tuks haphazardly flew by. I can still picture the lady vividly. Her clothes were ragged and dirty. The hot sun had worn her skin to a leathery texture. She appeared to be alone, then I noticed the tiny newborn baby she was breastfeeding. There was nothing surrounding her, no open stove that some families had next to them on the street nor other children or adults. Perhaps she had family and they were busy trying to earn money or find something to eat, but for that moment that I stopped in my tracks and saw this lady. She was so alone that even the noise, chaos and dirt of the street she sat in escaped her. Despite my struck stare she did not look back. People walked on by watching where they tread. It was in this moment of shock and horror that I felt a wave of anger crash over my body: the image of a lady so frail breastfeeding her child while sitting on the ground of a dirty street was incomprehensible to me. I wondered where she had recently given birth and if it had been in a street like this, out in the open, in public, delivering her crying baby to the sound of car horns. You simply did not see this in London. Who would be interested in this lady and her child? And that’s when I realised that this babe is the face of a future child who is likely to be sold or coerced into child prostitution in one of the hundreds of brothels throughout the city. In a few years time I could see the circumstances in which this lady could be cornered into either selling her child or letting her child go- living on the street fending for oneself is hard enough, but add another mouth to feed and whatever money, food and other resources that can be scrounged are spread that much thinner. Many times promises are made by traffickers to hopeful parents who sell their children for a lump sum of money ensuring them that the children will be looked after and provided with jobs that will send income home. Perhaps this is the point where hope creates illusion and a mother can rationalize the decision to sell her baby. Is this barbarism or vulnerability? Do the parents really understand what will happen to their children when they sell them? What are their options and how are they actually supposed to care for a child or children when they have neither the food nor shelter? Who can judge this lady for her future decisions regarding this baby? Without being in the same desperate situation, it is hard to fathom how it would feel and what should and should not be done. Living is one thing, survival is another. The necessity to survive is the breeding ground for decisions that would otherwise seem highly irrational. I stood amidst the crowd watching this lady and newborn child sitting in the middle of the street, like a moment-less island in the world that walked on by. I wonder where they are now. I wonder how the old woman is. I wonder how the child is. The noise and pollution of a bustling city street juxtaposed with the purity of birth and the struggle of life echoes in my mind.